A game kind of made specially for let-off-studios. 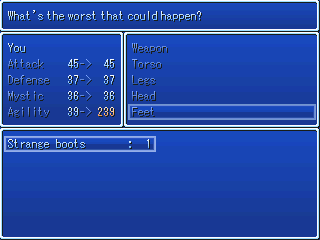 Can you get rid of the curse of the boots? The idea of helplessly burning to death in a tiny campfire is really funny to me for some reason. Playing the role of an incredibly incompetent adventurer who has enormous trouble with things that RPGs normally make trivial is fun. I hope I didn't wake up my housemate with all my laughing...! For some reason, I keep thinking I can push that box or somehow escape the fire... I can't. You have to try everything at your disposal to try and stop those magic boots. That's all I can say.